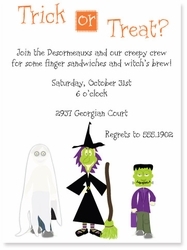 Trick or Treat Halloween Party Invitations by Pink Peppermint Paper, LLC. Description: Invite friends and neighbors over for some trick-or-treat fun with this whimsical invitation featuring kids in disguise. Perfectly set the tone for silly, not scary fun on Halloween.